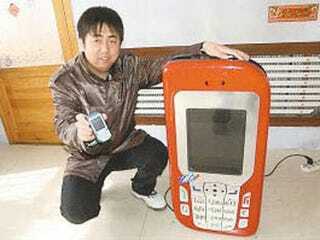 Mr Tan from Songyuan city, China, claims to have built the world's largest cellphone. The cellphone stands 3-ft high and weighs in at 48lbs and is 620 times bigger than his own, normal-sized cellphone, which he used as a model for the gigantic, pointless and generally fantastic handset. Yeah, we know—"video or it didn't happen," right? Well, we're working on it. Jeez, give us a break guys, Mr T smashed up our offices and the cleanup is immense. Nevertheless, the mammoth mobile totes a working internet connection of sorts and an onboard camera, but it completely lacks a battery, as Mr Tan couldn't build one large enough—what a slacker. The humango-handset relies on a mains outlet for power, and a local journalist verified its functional state by sending SMS messages and making a call.